Hop in a snowmobile and explore it in style. Vikendi, PlayerUnknown’s Battlegrounds' new snow map, has left the test servers and is now live for everyone to skid around in on their snowmobiles. You’ll want to dress up warm if you’re going to brave the chilly island, but unfortunately all the new warm clothing necessitates working through the Survivor Pass. Tourists should have a good time, as Vikendi’s got some unusual sights. There’s the dinosaur amusement park, for instance, complete with a roller coaster and bumper cars. You can even climb the roller coaster tracks and take potshots at scurrying enemies below. There’s a cosmodrome, too, if you fancy getting your science on. It has a rocket! 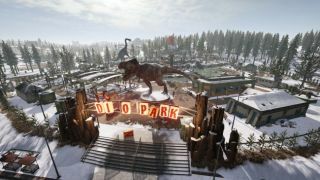 I had a chat with PUBG’s world art director about the new map a couple of weeks ago, and PUBG Corp’s goal with the island has been to create something that sits between the big maps, like Erangel, and the faster-paced 4x4 Sanhok map. It’s a map that’s designed to be fun for snipers, but also full of close-combat encounters in towns, cities and the aforementioned amusement park. Outside of civilisation, the thick alpine forests should make for some tense hunts, too, reducing visibility and providing loads of cover. And you don't want to get caught in a snowstorm, where it will be even harder to see what's in front of you. Along with the new map, there’s the new pass. The Survivor Pass can be levelled up by completing missions, netting yourself new items and skins. It’s free for everyone, but you'll need to spend cash to get the best stuff. The Premium Survivor Pass will set you back £7.49/$10 and includes over 60 skins and emotes. PUBG isn’t free-to-play, so it’s worth noting that as a new player you would need to drop £25.57/$29.98 to get access to everything, and it will become more expensive when PUBG’s winter sale ends on January 3.